Even minute doses of endocrine disruptors can interfere with the activity of natural hormones. The full Scientific Statement represents a comprehensive review of the literature on seven topics for which there is strong mechanistic, experimental, animal, and epidemiological evidence for endocrine disruption, namely: obesity and diabetes, female reproduction, male reproduction, hormone-sensitive cancers in females, prostate cancer, thyroid, and neurodevelopment and neuroendocrine systems. EDCs such as bisphenol A, phthalates, pesticides, persistent organic pollutants such as polychlorinated biphenyls, polybrominated diethyl ethers, and dioxins were emphasized because these chemicals had the greatest depth and breadth of available information. … A conclusion of the Statement is that publications over the past 5 years have led to a much fuller understanding of the endocrine principles by which EDCs act, including nonmonotonic dose-responses, low-dose effects, and developmental vulnerability. By “comprehensive” they weren’t kidding. Their bibliography includes over 1300 articles. This has really been an emerging field where there is much stronger evidence now. 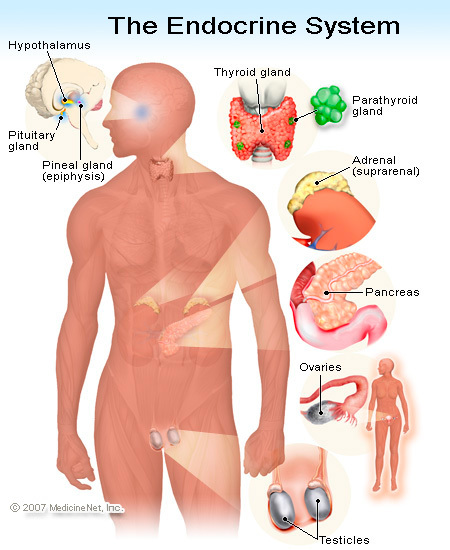 The endocrine system is a collection of glands all over the body that produce hormones, like insulin, that control metabolism, growth, sexual functions, nerve functions like sleep, depression, irritability and other moods. Just about every cell in our body is affected by these hormones, so the function of every cell/tissue/organ has the potential to be disrupted when these hormones go awry. These chemicals can act at extremely low-dose concentrations. Our exposure to these chemicals can be chronic and lifelong. There are tens of thousands of chemicals in the environment that act as endocrine disruptors but that have not been tested for health effects. It was 9 years ago that I first became aware of this link through my work in diabetes. This study found that the odds of having diabetes were 38 times higher for people with high blood levels of persistent organic pollutants (POPs) than for people with low levels. That was an unusual and extraordinarily high risk! I blogged about it here. Greater than 90% of POPs comes from animal foods in the general population without occupational or accidental exposures. That was 9 years ago. That animal foods are our greatest source of exposure is even more true today because the use of these chemicals has increased. Why animal foods? The reason for this, as I often explain, is two-fold. Endocrine disruptors are 1. often fat-soluble and 2. they bioaccumulate. So, there’s going to be more chemicals in fatty meat and dairy than on a fat-free tomato. This has been my beef with the EWG’s Dirty Dozen for years. They only address fruits and vegetables. They don’t even include grains like wheat which constitute the foundation of the American diet, and which have been found to contain pesticides and other contaminants at levels sometimes higher than produce. Foods of animal origin are the greatest source of human exposure to PCBs and dioxins. Potential contaminats in feedstuffs include environmental contaminants such as the polychlorinated biphenols (PCBs), dioxins and heavy metals including mercury, lead, or cadmium. Pastureland may [also] become contaminated with these industrial pollutants. Contaminated fats or oils added either intentionally or unintentionall to manufactured feeds can be a source of dioxins and PCBs. Fish oils or meal used as animal feed ingredients may contain high levels of contaminants if they are produced from fish grown in poluuted areas. Foods of animal origin may become contaminated during processing. Take another look at this graph of our weight over time. The light blue at the bottom is “overweight” and the dark blue is “obesity.” GMOs and their attendant pesticides (Roundup Ready) have been available since the 1980s, allowing pesticides to be sprayed directly on the food part of the plant. The study of nutrition, going forward, will have to be concerned not only with the nutrients we want in food, but the chemicals we don’t. This entry was posted in Uncategorized on September 30, 2015 by Bix. Any idea how organic meat compares to conventional meat when it coms to POP contamination? Contamination Of Free-range Chicken Eggs With Dioxins And Dioxin-like Polychlorinated Biphenyls, Molecular Nutrition and Food Research, October 2006. “Organic” meat is marketed as being fed “organic” feed. Recall that the USDA allows food labeled “organic” to be grown with manure from factory farms (USDA: “Herbicide residues [e.g. Roundup] have been found in manures and manure-based composts.”] and with synthetic pesticides directly. “Organic” pesticides can also act as endocrine disruptors. The contamination of our food is a direct result of the contamination of our environment. Bioaccumulation puts all animal food, organically raised or not, at higher risk for this contamination. My understanding is that “pastured” and “organic” can be quite different, as you point out. Organically raised animals can be called organic despite being fed corn and soy, which are not foods they’re really cut out to eat. Organic can also be pastured, with hay in the winter, but as you point out, Bix, the health benefits of pasturing depend on the quality of the pasture. One thing I read recently (can’t remember where, but will tell you if it comes back to me) is that pastured animals are generally more humanely raised, as they’re doing what they would do naturally–graze in the open air and fields. On the other hand, “organic” meats & poultry can be raised in execrable conditions of caging, overcrowding, etc., yet still pass the rules for organic. It’s all very frustrating, and personally I’m for whatever is best for the animals–they’re God’s creatures too, at least that’s what the Franciscans say! Best not to eat them, anyhow, given all the confounding problems you mention.